Violence against civilians escalated in Myanmar, the Democratic Republic of Congo (DRC), South Sudan, Central African Republic and Iraq in 2017. It continued unabated in Syria, Nigeria and Yemen. Entire communities paid a staggering price of death, injury and loss, and millions fled their homes in search of safety. 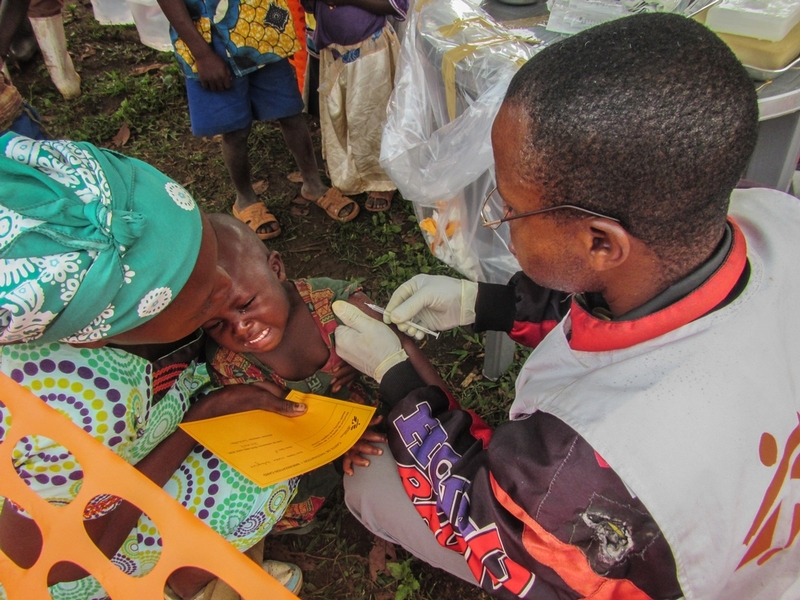 Treating the wounded and responding to basic health needs, malnutrition and outbreaks of infectious disease, Médecins Sans Frontières (MSF) provided lifesaving care to those caught up in conflict as health systems collapsed and living conditions deteriorated. Where we were unable to secure direct access to those trapped at the heart of the violence, in places such as Myanmar and Syria, we focused our assistance on those who had escaped. MSF had been responding to the humanitarian needs of the marginalised ethnic Rohingya minority in Myanmar for years. Targeted attacks of unprecedented scale by the Myanmar military in August 2017 drove another 660,000 or more Rohingya into neighbouring Bangladesh, where we ramped up our activities in response. We dealt with multiple disease outbreaks triggered by the ballooning refugee population’s abject living conditions and poor underlying health. 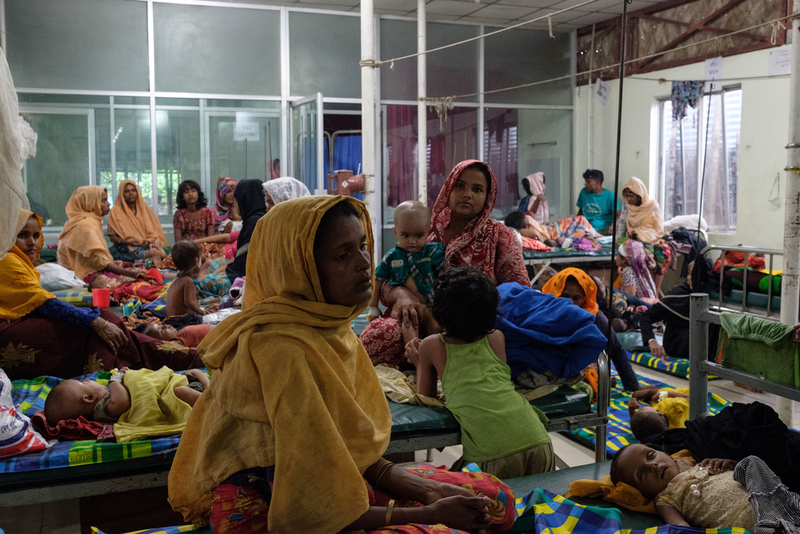 Retrospective mortality surveys carried out by MSF epidemiologists revealed the extreme violence inflicted in Rakhine state: by the most conservative estimate, at least 6,700 Rohingya were killed in the space of a month. Continued violence and mass displacement in Nigeria’s Borno state has uprooted more than two million people, many of whom have regrouped around garrison towns controlled by the Nigerian military. 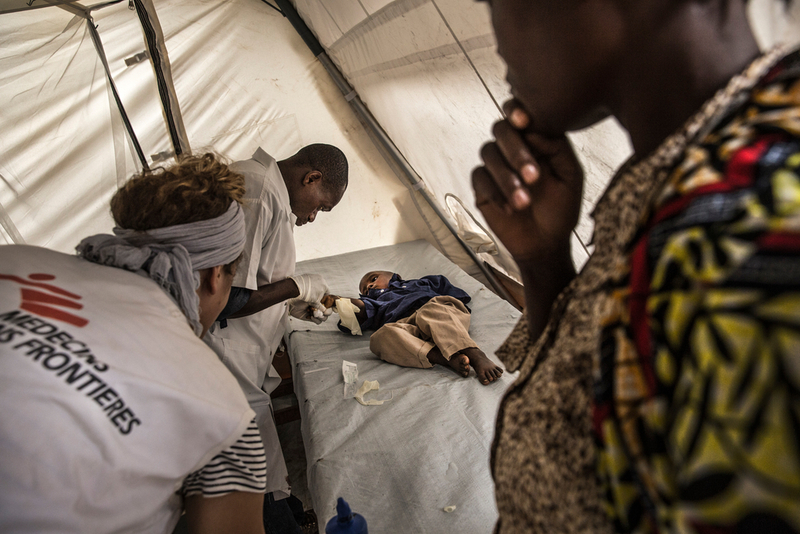 In January, an airstrike hit a camp for displaced people in Rann, where MSF was running a health facility. It killed at least 90 people, including 3 MSF workers, and injured hundreds. Despite the insecurity and challenges in accessing many areas, MSF teams conducted emergency interventions in 11 towns in Borno state, providing nutritional and medical care, relief items, and water and sanitation in displacement camps. However, people living in areas controlled by armed opposition groups remained cut off from aid. There was no let-up in Yemen’s war in 2017 or in the trauma injuries suffered as a result. Preventable diseases such as cholera and diphtheria also re-emerged, as the country grappled with a total breakdown of its medical, sanitation and economic systems, and with import restrictions on fuel, food and medicines. 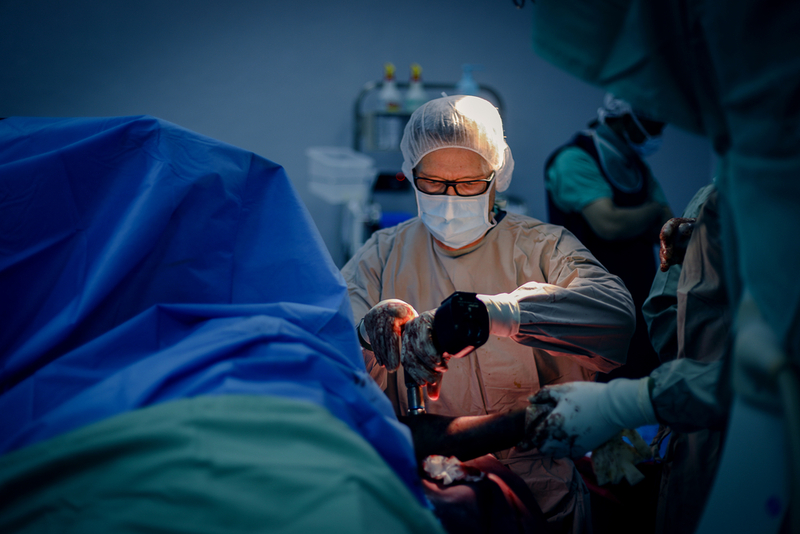 Dr. Martin an orthopedic surgeon while performing a surgery at MSF Aden hospital, Yemen. He is a German expat doctor, specialized in orthopedic internal fixation and was sent to Aden to support and train the local team of doctors in performing internal fixation surgery’s. The situation in war-ravaged Somalia also remains extreme. Since withdrawing from the country four years ago following repeated attacks on our teams, we have continuously monitored the situation and re-engaged with the relevant authorities. Despite ongoing security concerns, we returned to Somalia in 2017, opening a nutrition programme in the Puntland region and expanding our services throughout the year. However the scale of our activities remains limited; our ability to operate depends largely on the acceptance and active support we receive from the authorities and host communities. In both Raqqa in Syria and Mosul in Iraq, bombs rained down on trapped civilians as coalition forces wrestled back control from the Islamic State group. In Mosul, the frontlines cut through densely populated areas in the west, holding people under siege, sometimes for months on end. In the midst of the battle, some of the injured had to wait days before seeking medical care. 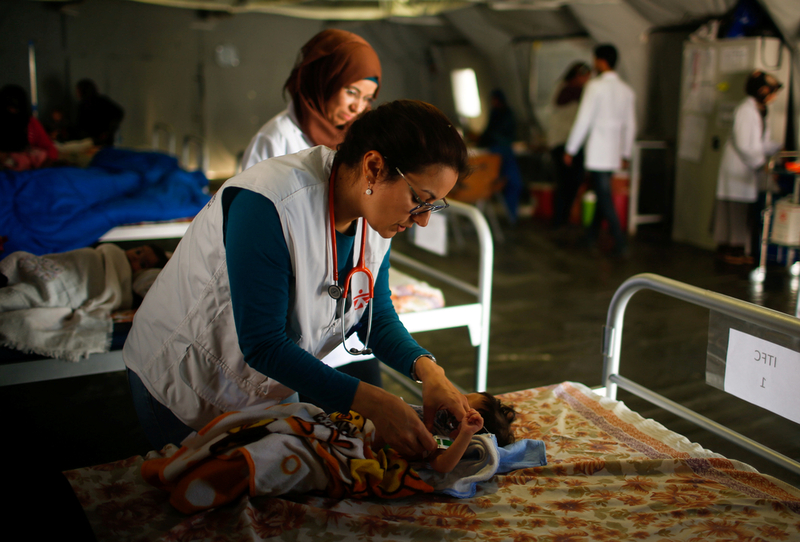 When the fighting was at its most intense, our emphasis was on trauma surgery, but we also provided paediatric, obstetric and primary healthcare, and treated malnutrition for those escaping Mosul. With many organisations, including MSF, focusing on the first stages of trauma care, a functional network of medicalised transport was lacking, as were easily accessible referral facilities for definitive surgery. A doctor checks a patient Iraqi girl at a hospital run by Medecins Sans Frontieres in Qayyara, south of Mosul. Our teams saw fewer wounded in the battle for Raqqa in Syria. This raised questions about what was happening in an area of urban warfare and bombardment, and whether people were accessing any care at all, or simply dying. To this day we do not know. We provided medical assistance to those fleeing Raqqa as they regrouped in camps around the area, but in general aid relief was scarce. Several other long-running, lesser reported conflicts escalated. Conflict and violence affected millions of people in South Sudan, where medical facilities and staff were not spared. MSF’s clinics and hospitals were looted and our staff and patients forced to flee. More than two million South Sudanese were forced to flee the country, creating the world’s fastest growing refugee crisis. This prompted a huge MSF response in Uganda, DRC, Ethiopia and Sudan. 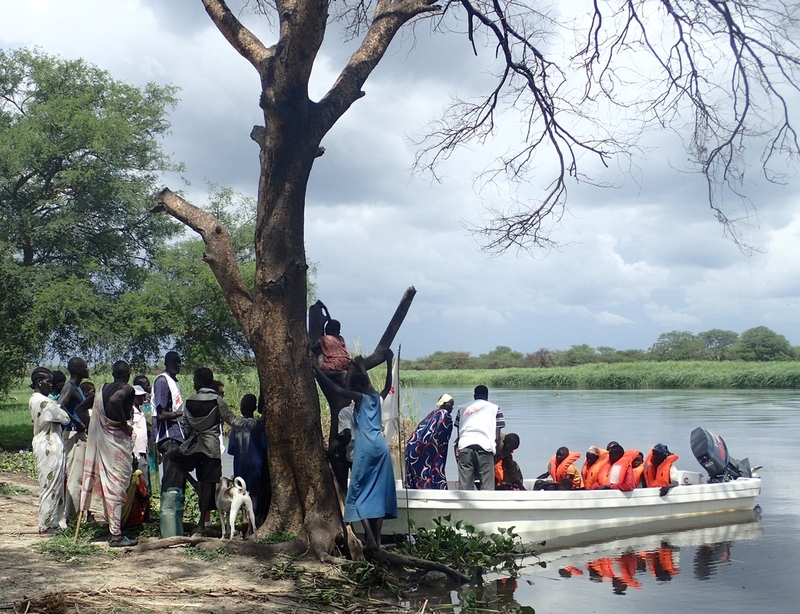 An MSF boat ambulance reaches patients in remote communities in northern Jonglei State, South Sudan. DRC itself was wracked by violence, especially in the Kasai region, where 1.5 million people were displaced. Our teams were able to intervene only when the fighting subsided. We discovered extremely high rates of severe acute malnutrition among young children in the area, with over 1,000 under-fives treated between June and September 2017 alone. Our teams also provided comprehensive paediatric care and surgery. In Central African Republic, full-blown conflict resurged across much of the country. Several towns emptied as people fled in terror, seeking refuge in churches, mosques and even MSF hospitals, or surviving hand-to-mouth in the bush. In response to the towering health needs, MSF provided medical care to communities across the country. Meanwhile, in Europe governments struck deals with Libya to keep migrants and refugees from reaching their shores, fully aware of the widespread torture, detention and criminal extortion this left people exposed to. 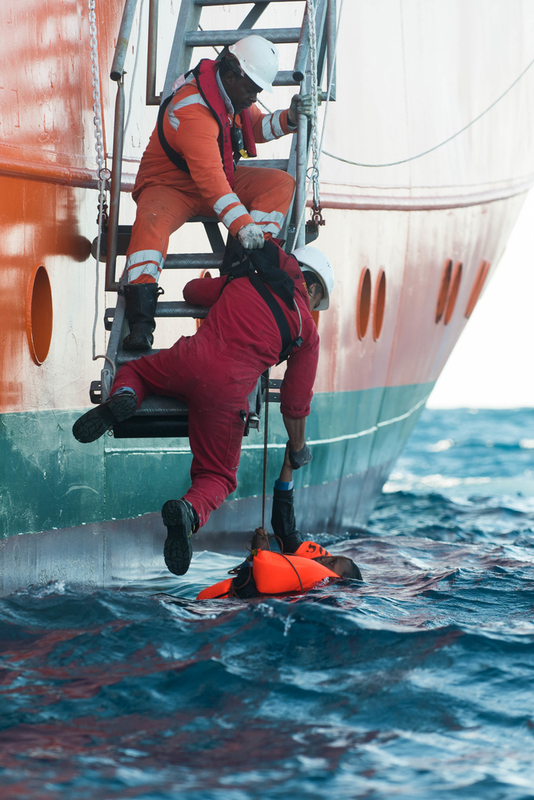 Smear campaigns were orchestrated to discredit lifesaving search and rescue efforts on the Mediterranean Sea, despite some 3,000 people drowning in 2017. Nevertheless, MSF remained committed to saving lives that would otherwise be lost, and to throwing light on the human cost of deterrence policies. In a nightmarish day on the Mediterranean, 99 survivors from a sinking rubber boat were rescued by the Aquarius, a search and rescue vessel run by Médecins Sans Frontières (MSF) and SOS MEDITERRANEE, but an unknown number of men, women and children are missing, presumed drowned. Two women are confirmed dead. As a direct result of missing childhood vaccinations, diphtheria broke out in Yemen and among refugees from Myanmar in Bangladesh, prompting MSF vaccination and treatment campaigns. People still perish from infectious diseases that should be confined to history. In 2017, MSF supported the Madagascan authorities’ response to an outbreak of the plague, which took 200 lives. Massive cholera outbreaks raged through Yemen and East Africa. DRC experienced its most significant cholera outbreak in 20 years, affecting 55,000 people and causing 1,190 deaths across 24 of the country’s 26 provinces. Our teams treated almost half of the registered cases. Measles also ravaged communities across eastern DRC. 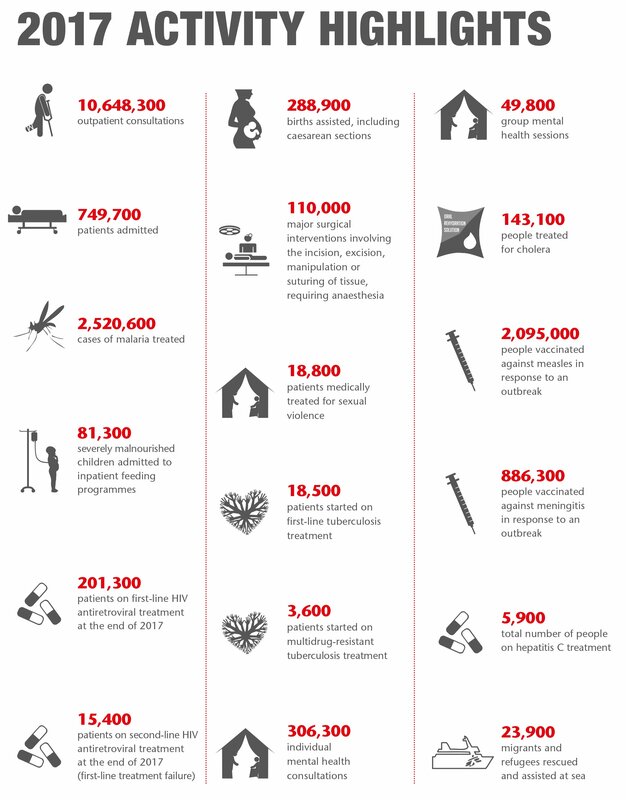 In just eight months, MSF treated almost 14,000 cases and vaccinated over a million children. Our teams assisted over 300,000 childbirths in 2017, working in large maternity hospitals, including in eastern DRC, Iraq, Syria and Afghanistan, where women have few other safe, free options. Unsafe abortions are one of the world’s main causes of maternal mortality and are entirely preventable. At our International General Assembly in 2017, MSF reasserted its commitment to providing safe termination of pregnancy to all women and girls who need it. MSF remains the largest non-government provider of TB treatment worldwide. Together with partner organisations and local health authorities, we are pioneering new drug-resistant treatment options, including regulated trials in South Africa and Uzbekistan, where our teams test shorter, more effective and better tolerated regimens. 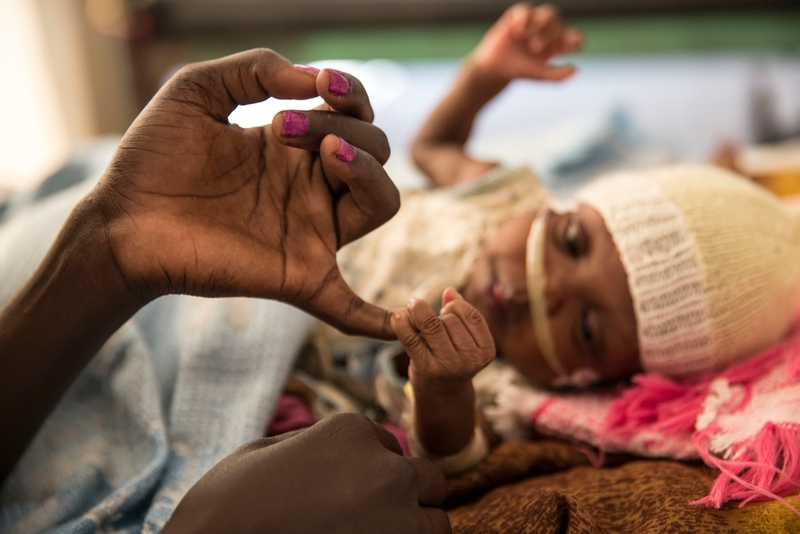 4-months-old Mary James was admitted three times in an MSF hospital in the UN compound in Malakal. She had serious respiratory problems but she improved after receiving antibiotic treatment. In 2017, we also advocated scaling up the use of the new TB drugs bedaquiline and delamanid through the MSF Access Campaign, and urged governments and stakeholders to increase patient treatment through the #StepUpforTB campaign. We are hugely grateful to all our donors, who make our work possible, and to all our dedicated MSF field workers, who give their time and skills to assist others, at times at considerable risk to themselves. Our teams remain committed to finding and releasing our three colleagues who were abducted in DRC in 2013 and remain unaccounted for. Philippe, Richard and Romy, our thoughts are with you, your friends and your families.